I don’t really know the kids on this team, but I feel like I do, because I know where they go to class, and I know their professors and their coaches. They played hard Saturday, but in the end, it was pretty clear the better team won. 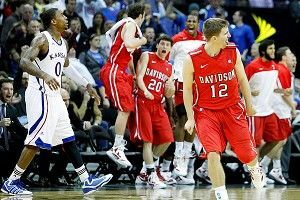 The story of Davidson basketball, I once wrote, is “the chase of the chance,” and that shot by Jason Richards against Kansas on March 30, 2008, which would have put Davidson in the Final Four (! ), was that chance in concentrated form. The moment was so full of possibility it was almost hard to watch. March 2008? It was awesome. But 16 wins … then 18 wins … then 20? That’s somehow more authentic. More instructive. Davidson’s run in retrospect is a reminder: It’s not about the ring. It’s about the reach. Chances come and go. The chase doesn’t stop. Davidson returns to the tournament this year as 13-seed. They’re scheduled to face the Rick Pitino-led Louisville Cardinals, a 4-seed, at 1:40 p.m. Eastern on Thursday.